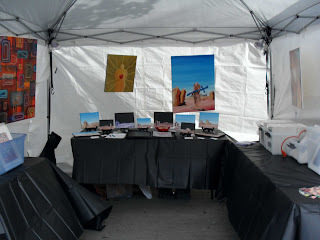 Last weekend, 4/02-4/04, I participated in my first major art festival...The Deep Ellum Art Fest. When I was invited to share a booth with Essie Graham and Scott Dorn, I jumped at the chance not knowing what to expect. It's been a week since the fest, so I thought now would be a good time to record my thoughts. First of all, it was A LOT OF WORK just getting ready prior to the Fest...making sure I had all of my info packs ready, paintings photographed, and all the knick knacks packed that we might need. The day of set up was exhausting. We lovingly referred to our booth as the Ghetto Booth because this was our first time to do a big show like this and our funds were low...we could only afford the bare essentials. Humble beginnings are great because it leaves so much room for future growth and expansion...exciting times!!! It wasn't until noonish on the 2nd day that I really started to enjoy the event and from there things just got better and better as my setup exhaustion from Friday started to fade and the energy of the event started to spread. A couple of friends and family came out to visit with me and I sold 3 small paintings, so that was a plus! On Easter Sunday, the last day of the event, we had a little rain while I was painting at the Art Love Magic section of the festival, but we still had a good time. I felt that the most important thing over the whole weekend was the wisdom we gained from the experience that will be helpful for other events. Sometimes, we can read about up on something, study somebody else's experience, and plan for weeks, but the actual experience turns out to be the best teacher. I've been incredibly blessed by this experience and I'm exceedingly thankful to Jesus for it!